Sitting on the back porch, we heard a big crash, and went to the center hill to find this tree down. It hadn't been as windy today as the previous days, but root rot won this battle. Cows seemed to enjoy the green leaves! True eco-friendly yard mowing. Or is that yard moo-ing? We're ready for earth day. The last line is Charles' contribution to the list. 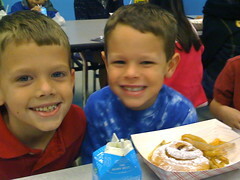 I don’t know if its an April Fool’s gag, or if someone in the kitchen woke up late, but the “nutritious” breakfast at school this morning consisted of doughnuts and french fries.